Well, the book promptly arrived (thank you Speedy Hen – very good service) and I’ve been reading it over the last few days. I wasn’t actually sure what to expect with this book – would it be a review of contemporary appliqué styles and methods – or a ‘how to’ book? It turns out to be both of those things, and somewhat more in that it also contains, in Part 1, a very absorbing survey of historical and cultural perspectives on appliqué. Obviously, the book is restricted in size to the usual Batsford 128 page format, so there can’t be a vast amount of detail in the contexts part. However, there’s enough to make it clear that appliqué has a long history and is very diverse in its cultural contexts. Parts 2 (Design Skills) and 3 (Appliqué: the Basics) contain the ‘how to’ elements of the book. I found the section on how to transfer designs particularly useful and practical, and it contained some ideas that are unfamiliar, to me at least (e.g. soap and net method of transfer). The final part of the book, From Tradition to Innovation, is the longest; it contains loads of ideas about contemporary applications of appliqué techniques. There is a lot of information in this book, and the text is clearly written. But I think it’s really great strength is the quality and range of the images that illustrate the text. These have obviously been chosen with a great deal of care to demonstrate a huge range of appliqué techniques. Although, of course, the authors use their own work to illustrate certain points, the book is not particularly skewed towards them or towards any other individual makers, or indeed towards a particular style or approach. This is a real strength in a book that aims to ‘take a fresh look at the world of appliqué and surface ornament’ (as it says inside the front cover). So, in conclusion (because I must depart for a visit to the dentist) if you’re interested in appliqué techniques, this is well worth a look. 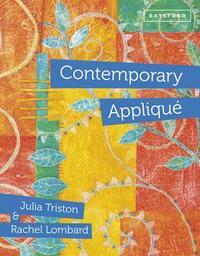 This morning I’ve ordered a copy of ‘Contemporary Appliqué’ by Julia Triston and Rachel Lombard. 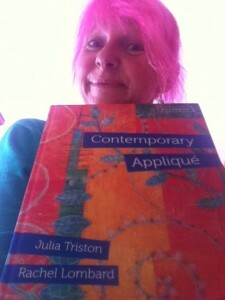 The book is just out – here’s a picture of the front cover. I’m excited about this because I think it will be a good and interesting read, and also, from a purely selfish point of view, because I know it contains an illustration of a piece of appliqué work that I did a couple of years ago. I’ve been working solidly all weekend and have had no time at all to do anything I actually want to do. Work will continue for the next seven days and then I’ll get a bit of a rest. The house is looking pretty squalid and the garden is full of weeds, so I guess I know what I’ll be doing when the work finally draws to a close. Still, from where I’m sitting right now (chained to the computer), even the prospect of weeding, cleaning the kitchen etc. doesn’t look too bad. And ordering this book gives me something to look forward to. When I have a large chunk of work on, like now, I often order a book so that there’s at least the glimmer of a bright prospect on the horizon. I have to keep reminding myself that lots of people are out of work/short of work/chronically underpaid for the work they do, so I have to count myself very fortunate. And once this batch of work is finished, I’m promising myself some time to spend on stitching and drawing more triangles etc. Won’t be long now…..